A one-of-a-kind experience can sometimes happen by accident. It can also be dreamed. This is the case with El Portal Sedona Hotel, a luxury hotel in the heart of Sedona. The dream started in 1980 when native Californians Steve and Connie Segner first visited Sedona. Enchanted by the area, more visits followed, and soon they decided to build a home at the foot of a beautiful Red Rock mountain. Recognizing Sedona was more than a nice geographic spot on the map, they sought to find a way to bring all the elements of nature and the soul of the Southwest they were experiencing into the creation of their new home. With determination, they contacted experts in the fields of architecture, construction and interior design, explaining their vision of an all-inclusive feeling of oneness with the land and spirit of the Southwest. Work began. After careful planning and execution, their vision became a reality. 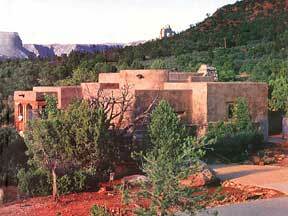 A spectacular home true to nature, true to the soul of Sedona, was theirs. Their new home, built of adobe, with actual 18-inch walls, as it was done hundreds of years ago, quickly became a frequent stop on scenic drives by Sedona tourists. And, based on its accuracy of Southwestern design and quality, it became the cover story for Bob Vila’s magazine, American Home and the book, Southwest Style. The experience of welcoming friends to their private home was wonderful for Steve and Connie. It soon became apparent that what the Segners thought was the end of their dream actually became the springboard for another: to build a luxury hotel – El Portal Sedona Hotel, an Oak Creek hotel.